Yarn: “La Jolla” from Baah! This was mostly knit on the bus over the course of about a month. I did bring it along to a couple shifts at the yarn store, partly because I had made a mistake during the increases and needed some help to fix it and partly because it was the lightest, simplest project I had on needles. Anyway, this was a fun stitch and I love how it turned out — it looks like fish scales to me! The cowl itself is a bit tall, but will be really nice if next winter has as many below 0° days as this winter has had. I love the color of the yarn, though — a bright pop of pink and a little bit of neon green is a welcome change from the grey tones of winter. 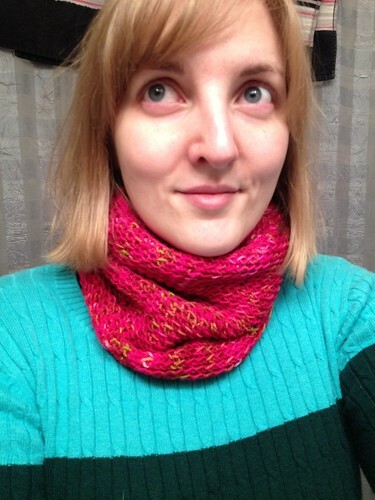 As a side note, this was the fourth Knitty pattern I’ve worked on. One more to complete a 101 in 1001 goal!